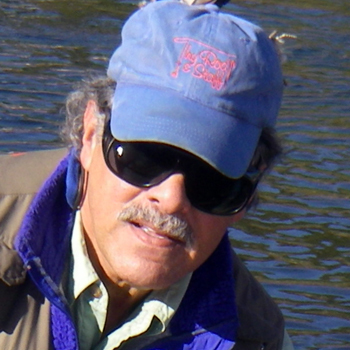 Frank R. Pisciotta is one of the most veteran fly fishing guides in California. He is the acknowledged “Dean of Guides” in the Tahoe region and established his Thy Rod & Staff guide service in Truckee in1984; having guided & instructed fly fishing there exclusively since. He was the region’s ORVIS-Endorsed Guide in Tahoe from 1991-2012. In 1996 he founded the Reel School of Fly Fishing, the only fly fishing school based in Truckee. It features one and two-day clinics for novices wanting to be introduced to the basic fundamentals to those who intent on improving their skills dry fly or nymph fishing. In 2014, along with fellow regional guide Jon Biaocchi, the Native Sons Tours was established. The Lake Tahoe area has always been known as a world-renowned, recreational paradise in the High Sierra. In 1979 Frank built his first home there, specifically in Truckee, the historic and increasingly up-scale ski town. At the time there were few fly anglers on the area’s waters. During the ‘80’s, Lake Tahoe’s “north shore” waters of Martis Lake (California’s first “Wild Trout” Lake) and the Truckee River progressively attracted more fly casters because of their trophy trout angling regulations. Currently there are eight (8) state-mandated “catch & release” waters with-in one hour’s drive of Truckee. Now, unbelievably, the region has arguably become a destination fly angling venue, with the big Truckee and the Little Truckee being the crown-jewels. Frank is fond of making a couple of comments about the area’s featured waters. “If you can consistently catch trout on the Truckee River; you will be very successful fly fishing in any other freestone stream.” In the Spring 2002 issue of Northwest Fly Fishing in his essay entitled “The Truckee River…A Lesson in Patience”, his opening sentence was “If you’re looking for easy fly fishing, don’t come here!” Most recently, in the February 2017 issue of California Fly Fisher he authored the essay entitled “Truckee River Primer”.